Judge Thelton Henderson, who is overseeing the police department, may take away arbitration from the union if he puts OPD in receivership. Federal receivership may make it easier to fire OPD officers accused of misconduct. The Oakland Police Officers' Association is one of the city's most influential political lobbies. At election time, the union typically outspends all other special interests in Oakland, as it backs politicians who are friendly to its cause and opposes those who are not. The 2012 election is no exception: The union is spending tens of thousands of dollars this fall in support of Councilmembers Ignacio De La Fuente and Jane Brunner who are trying to unseat Councilwoman Rebecca Kaplan and City Attorney Barbara Parker, respectively. Yet despite the union's outsized influence on Oakland politics, OPOA has struggled in vain to insert itself into the police department's decade-long federal oversight process. Beginning this summer, the police union has repeatedly tried to exert a broader role in federal court proceedings. In July, OPOA attorney Michael Rains unsuccessfully tried to win access to communications involving police officer discipline between Police Chief Howard Jordan and Robert Warshaw, the court-appointed independent monitor overseeing OPD's progress on federally mandated reforms. But on August 27, US District Judge Thelton Henderson, who presides over the federal oversight, issued a firmly written order denying the union's assertion that its lawyers could sit in on any consent decree-related hearings, and restricted OPOA's participation to matters only involving the union's contract. Rains, whose firm represented former BART officer Johannes Mehserle and unsuccessfully appealed his involuntary manslaughter conviction for the January 1, 2009 killing of Oscar Grant all the way up to the California Supreme Court, is renowned for his doggedness. Reflecting OPOA's ongoing concern that a court-appointed receiver could annul the union's existing contract, Rains and his colleague Rockne Lucia struck a tentative deal with attorneys John Burris and Jim Chanin that would have placed the police contract and discipline for non-command staff officers outside the authority of a court-appointed federal receiver. Burris and Chanin represent the victims of the so-called Riders, a group of rogue officers accused of abusing suspects and planting evidence. The Riders scandal led to the federally mandated reforms. Earlier this month, however, Henderson nixed the proposed deal between OPOA's attorneys and Burris and Chanin. "Plaintiffs and the OPOA may not limit by agreement the scope of any receivership the Court might impose," Henderson wrote in the October 19 order, reasserting his right to make crucial decisions about OPD's future and keep all options open for the extent of a potential receiver's authority. "The Court must make that determination after carefully examining all relevant factors." In an interview, Burris said that OPOA attorneys approached him and Chanin with their concerns about protecting the existing police contract. The two civil rights attorneys agreed to the proposed deal because they believe the contract is strong enough on discipline-related matters. "We've always felt that the issues related to non-compliance with the reforms come from the top, from the chief and the command staff's inability to get their line supervisors, the sergeants and the lieutenants, to do their jobs," said Burris. Whether or not the contract will be contested in receivership proceedings "will be a function of how broad a decision [Henderson] will make — he's been adamant that something has to be done," said Burris. Rains and Lucia did not respond to requests for comment. A critical aspect of OPOA's contract that could be under threat is binding arbitration. This protection allows officers — and other unionized municipal employees in Oakland — to appeal terminations to an independent labor arbitrator if they believe they have been improperly fired. The arbitrator is currently the second round of appeal that Oakland police officers go through when they face termination. After receiving termination letters, OPD personnel first undergo an internal appeal process called a Skelly hearing. Then if they lose the Skelly hearing, the officers have the right to take their case to an independent arbitrator. In recent years, arbitrators have overturned a number of high-profile police terminations. In February 2011, Officer Hector Jimenez was rehired with back pay after an arbitrator ruled that he had been unjustly fired for fatally shooting Jody Woodfox, an unarmed man who fled a July 2008 car stop in East Oakland. Jimenez had already shot and killed Andrew Moppin-Bucksin, also unarmed, on New Year's Eve, 2007. Sergeant Randy Wingate was also rehired in March 2010 after an arbitrator ruled that he had been improperly terminated for allegedly violating OPD policy during the search for the officer's lost cell phone. 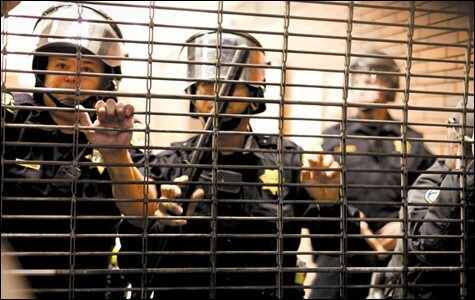 In fact, the history of independent arbitrator rulings in Oakland raises serious doubts as to whether Jordan will be successful in firing two officers for their alleged misconduct during last year's Occupy Oakland demonstrations. 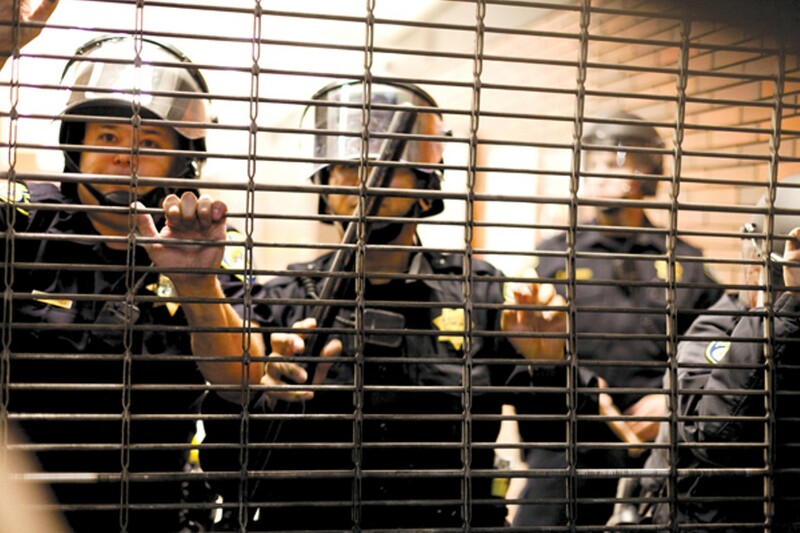 Earlier this month, Jordan, City Administrator Deanna Santana, and Mayor Jean Quan announced that the department planned to discipline 44 officers for various misconduct charges related to Occupy Oakland, and planned to fire two of them. The Express has learned that one of the officers who received a termination letter is Robert Roche, the cop who tossed a flash-bang grenade into a crowd of people trying to assist wounded war veteran Scott Olsen on October 25, 2011 (see "Cop Identified in Scott Olsen Incident?" 2/22). Roche and the officer facing termination will have the right to first challenge their firing in front of a Skelly hearing, before going to an arbitrator. The two-step appeals process is lengthy — arbitration hearings can take up to two years after the initial notice of termination — and costly if the proposed termination is overturned. Jimenez was rehired with roughly $200,000 in back pay early last year. Furthermore, overturned terminations can cause serious rifts within the department: Many Oakland cops are extremely resentful about the attempted termination of Officer Bryan Franks for the September 2011 shooting of Arthur Raleigh. Earlier this year, the San Francisco Chronicle reported that city lawyers allegedly withheld a potentially exculpatory report from Franks' attorneys during termination proceedings. The police union then later started backing Councilwoman Brunner in her quest to defeat City Attorney Parker and funded a hit-piece mailer against Parker that contained several false and misleading statements (see "De La Fuente, Brunner, and Cops Attack" ). As for Franks, he's back on patrol. Len Raphael, a candidate for city council District 1, North Oakland, has made opposition to binding arbitration a centerpiece of his campaign. In a race crowded with candidates supporting an increase in OPD's staffing levels, Raphael stands out for his consistent criticism of OPD's draw on city resources and the effect of binding arbitration on the department's ability to get rid of problem officers. Rashidah Grinage, the executive director of PUEBLO, believes Henderson is exerting his authority after years of growing frustration with the pace of reforms. "I think the judge is looking at this more holistically than the consent decree," said Grinage. "Whatever he's going to do, he's going to make it meaningful."